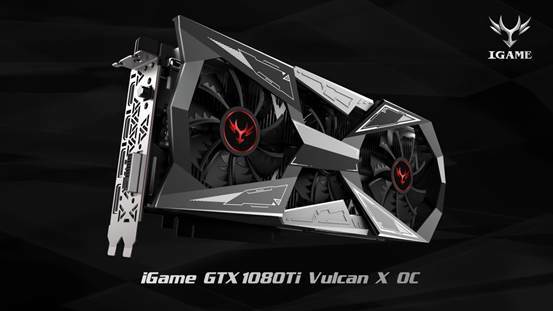 May 05th, 2017 Shenzhen, China – Colorful Technology Company Limited is pleased to announce the release of the world’s first graphics card with built-in LCD display : the iGame GTX1080Ti Vulcan X OC. Finally ready for release, the card will be initially sold in China from May 5 onwards. The iGame GTX1080Ti Vulcan X OC features a factory overclock of 1620 MHz on the core frequency and has a boost clock of 1733 MHz thanks to GPU Boost. The card runs 11 GB GDDR5X memory wired to a 352-bit bus. The card features a 16+2 phase digital power supply reinforced by IPP (iGame Pure Power) and is equipped with the SWORIZER cooler with built-in iGame Status Monitor as well as 1.68 million color-capable RGB lighting. The new SWORIZER cooler features a redesigned thermal solution that places the contact position of the heatpipe all in one copper base and uses a C-type design to reduce thermal resistance and enhance heat conduction efficiency. The cooling fins are cooled by three 92mm duall ball-bearing Saw Sickle fans which cools 86% more surface area than the suaul double-groove coolers. This design ultimately cools the iGame GTX1080TI Vulcan X OC. Next : Dell EMC Cloud for Microsoft Azure Stack Unveiled!